To mark the final weekend of his exhibition The Origin of Life at Beaconsfield Gallery, Dean Kenning will be in conversation with the artist Emma Hart to discuss his kinetic sculptures. Over the past two decades Kenning has reengineered obsolete equipment using simple electric motors and rubber. Sculptures such as Renaissance Man, the ‘rubber plants’ series, as well as interactive sound work with keyboards and rubber ‘fingers’ currently on display at Beaconsfield, confront audiences viscerally as agitated living things. Against the autonomy often ascribed to objects placed within galleries, Kenning’s kinetic works operate on a dumb plane of automation, engaging viewers at the level of humour, the uncanny and the abject. 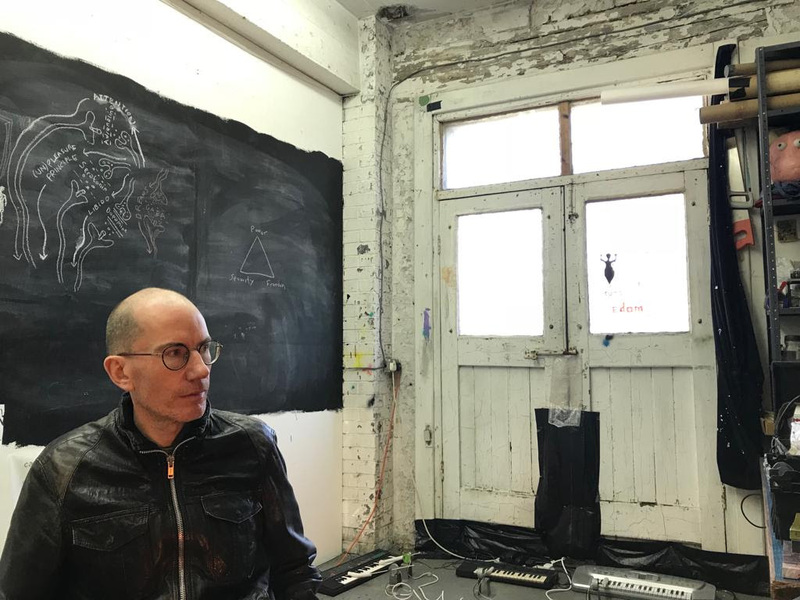 Informed by horror and psychoanalysis, and emerging from a DIY approach to artistic production, Kenning’s kinetic works generate an aesthetic of machinic repetition. Emma Hart lives and works in London. In 2016 she won the Max Mara Art Prize for Women in collaboration with the Whitechapel Gallery. In 2015 she was awarded a Paul Hamlyn Foundation award for Visual Art. Recent solo exhibitions include: Banger, The Fruitmarket Gallery, Edinburgh (2018), Mamma Mia! Whitechapel Gallery and the Collezione Maramotti, Italy (2017); Commercial Breakz, Frieze Art Fair, London (2017); Love Life with Jonathan Baldock, Peer, London, The Grundy Gallery, Blackpool and De Le Warr Pavillion, Bexhill (2016-7); Giving It All That, Folkestone Triennial (2014);Dirty Looks, Camden Arts Centre (2013). Recent group exhibitions include: Further Thoughts on Earthy Materials, Kunsthaus Hamburg, DE; In My Shoes, Arts Council Touring Exhibition, Yorkshire Sculpture Park; An ear, severed, listens, Chert, Berlin, DE (2017);Sticky Intimacy, Chapter, Cardiff, UK (2016); Only the Lonely, La Galerie CAC Noisy Le Sec, France (2015); Dear Luxembourg, Nosbaum Reding, Luxembourg (2015); Hey I’m Mr. Poetic, Wysing Arts Centre (2014). Hart received an MA in Fine Art from the Slade in 2004 and completed her PhD in Fine Art at Kingston University in 2013. Hart is a lecturer at the Slade. Dean Kenning is an artist and writer. His artworks range from kinetic sculptures to videos and diagrams, often employing DIY, allegorical and autodidactic methods and modes of representation to engender visceral, uncanny and humorous encounters and to explore political and philosophical material. Solo exhibitions include The Origin of Life, Beaconsfield Gallery (2019), Where IT Was, Piper Keys (2018), Commonism, Five Years (2010). His next solo exhibition is at Matt’s Gallery in June 2019. Group exhibitions include Morphologies of Invisible Agents, Space (2019), Exo Emo, Greene Naftali, NY (2017) and Plague of Diagrams, ICA (2015). Kenning is a member of the Capital Drawing Group and the Social Morphologies Research Unit. He has published articles in journals such as Third Text, Art Monthly and Mute, including on the politics of art and art education. He is a Researcher at Kingston School of Art and also teaches Fine Art at Central St Martins.